Summary: In Martin, St. Lucie, Indian River, and Okeechobee Counties there are over 50 schools designated as Title One. This signifies a majority of their students receive free or reduced lunch based on family incomes falling close to or below the federal poverty level. Title One schools often suffer from limited supplemental teaching resources such as field trips and outreach programs due to the costs associated. Inwater Research Group, Inc. will create a sea turtle education program for these schools. We will target schools with the highest percentage of students on the free or reduced lunch list on the Treasure Coast and offer them a day of free educational outreach programs. Each lesson will be centered on sea turtles and their biology, ecology, and conservation. They will include hands-on experiences with real artifacts, specimens, field equipment, as well as pre- and post-lessons for the teachers. Students will learn about the important role sea turtles play in the marine ecosystem as well as what they can do in their daily lives to be a part of the conservation process. In total, nine schools will be chosen throughout the school year and offered the program. This program has the potential to reach 1800 of the most at-risk and underserved students from Martin, St. Lucie, Indian River, and Okeechobee counties. Results: Students ranging from 3rd-8th grade participated in hands-on presentations or programs that reflect real research, while teaching them important conservation messages. 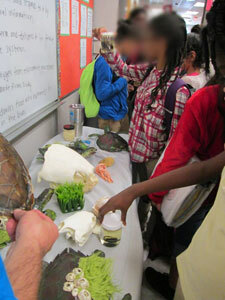 Students learned about sea turtle biology, adaptations, classification, habitats, predator/prey relationships, and more. We focused heavily on human interactions and human-related injuries including boat strikes, fishing hook/line ingestion and entanglement, lighting issues, pollution, and more. We discussed ways students could help in reducing these impacts in their daily lives. When looking over post-quizzes from several of the schools, we noticed a disconnect between why students thought sea turtles were endangered (hunting) and how they could help (pick up garbage). Despite the fact that we did not discuss hunting as a reason for turtles being endangered and rather offered numerous other reasons, this seemed their default answer, even after the presentation. We began writing “What Can I do?” on the board and going over the ways to help after discussing the reasons and the connection became more apparent on subsequent post-quizzes.